A 28-YEAR-OLD Mt Darwin man is on the run after he allegedly killed his girlfriend’s boyfriend in a suspected love triangle, police have said. Tinashe Nyakudya (28) of Chiruma 1 village under Chief Nyamaropa reportedly went berserk and fatally axed Witness Chisova (41) after discovering that they were dating the same girl. Mashonaland Central police spokesperson Assistant Inspector Petros Masikati confirmed the incident. “Police are looking for a murder suspect Tinashe Nyakudya who reportedly struck Chisova with an axe during the night of Saturday,” Masikati said. Chisova allegedly went to visit the girl unaware that Nyakudya was in her bedroom on the fateful night. 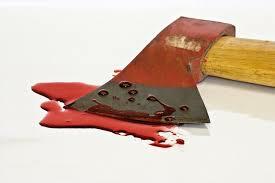 Nyakudya, armed with an axe, hid behind the door and struck Chisova on the head when he forced his way into the room. Chisova died on the spot as Nyakudya allegedly ran away. The girl, who the police said was present, did not report the murder but also fled from the room.